Hello Folks, I just uploaded a new version of the Delphi IDE Colorizer (DIC) plugin with support for RAD Studio 10.1 Berlin. DIC is a styling plugin for the RAD Studio IDE which allow you customize the UI of the IDE Workspace . You can use a predefined theme or create your own, also DIC is compatible with the VCL Styles. You can download the installer from Github. By the way, on the last weeks I’ve updated another projects adding support for RAD Studio 10.1 Berlin. The Network List Manager (NLM) API (introduced on Windows Vista) allows you to retrieve a list of available connections and properties of each network .Also the NLM API support notifications (events) about the availability of new network connections or changes to existing network connections. This API is useful for filter networks, based on his attributes and signatures. Also you can use this API in your own Application to adjust their logic depending on: which network they are connected to; or what the network properties are. 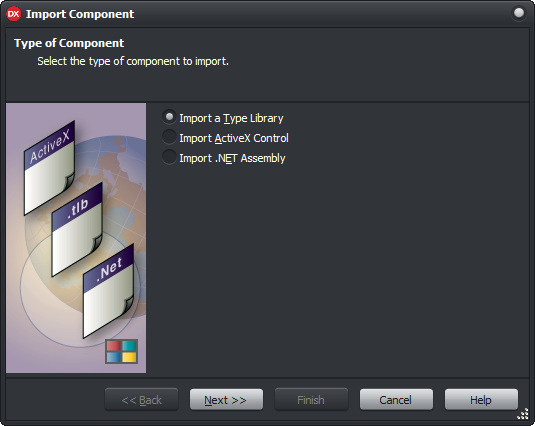 Ok, So the first step to use this API from Delphi is import the Network List Manager Type Library (C:\WINDOWS\system32\netprofm.dll) from the option Component-> Import Component as is show below. After of this the NETWORKLIST_TLB unit will be created containing all the Interfaces, Types and Enumerations of the NLM API. Note: Depending of your Windows version the content of the imported type library can change, because some additional Interfaces and types was added in Windows 8. The INetworkListManager is the main interface to access the methods to perform NLM API functions Like enumerate Networks, Connections and check the overall connectivity state of the current machine. This is the definition of the INetworkListManager interface. In order to access to this interface you must declare a INetworkListManager variable and call the CoNetworkListManager.Create; method to get an instance to such Interface. Check the next sample console application which shows the current connectivity of the machine and if the internet connection is available. The NLM API allow you to enumerate network connections using the INetworkListManager.GetNetworkConnections method, this function returns an instance to the IEnumNetworkConnections interface that enumerates all network connections on the machine, each element returned by the IEnumNetworkConnections.Next method represents a INetworkConnection object. Check the next sample console application which shows how enumerate the connections with his connectivity, domain type, network adapters associated and so on. NLM_DOMAIN_TYPE_DOMAIN_NETWORK       : Result := 'Domain Network';//The Network is an Active Directory Network, but this machine is not authenticated against it. NLM_DOMAIN_TYPE_DOMAIN_AUTHENTICATED : Result := 'Domain Network Authenticated';//The Network is an Active Directory Network, and this machine is authenticated against it. For enumerate the networks available on the local machine you must use the INetworkListManager.GetNetworks method passing a valid NLM_ENUM_NETWORK value. from here you can gain access to several elements related to the network like Name, Description, Connectivity, Network Category and the local date and time when the network was created and connected. The NML API exposes several events (notifications) that you Application must implements to get network related events. These callback functions that are called automatically when the respective events are raised. INetworkConnectionEvents Get network connection-related events. INetworkEvents Get network related events. INetworkListManagerEvents Get overall machine state related events. INetworkCostManagerEvents Get machine-wide cost and data plan related events. INetworkConnectionCostEvents Get cost and data plan status change events for a connection. Note : The next sample shows how subscribe to the INetworkEvents only. I will leave it as reader’s exercise the implementation of the another events. The INetworkEvents interface can inform when a Network was added, deleted or modified. To receive the notifications related to these events you must inherit a class from this interface and implement the next methods. then you need get an instance to the IConnectionPointContainer interface, after using the IConnectionPointContainer.FindConnectionPoint return a connection point for the interface and finally call the IConnectionPoint.Advise method to establish the connection with the event. When you not longer need to use the event, you must to terminate the advisory connection previously established with the connection point using the IConnectionPoint.Unadvise method. Check the next sample console application which implements the INetworkEvents interface. All the source code posted on this article is available on Github. Categories: Delphi, Networking | Tags: Delphi, Networking | Permalink. 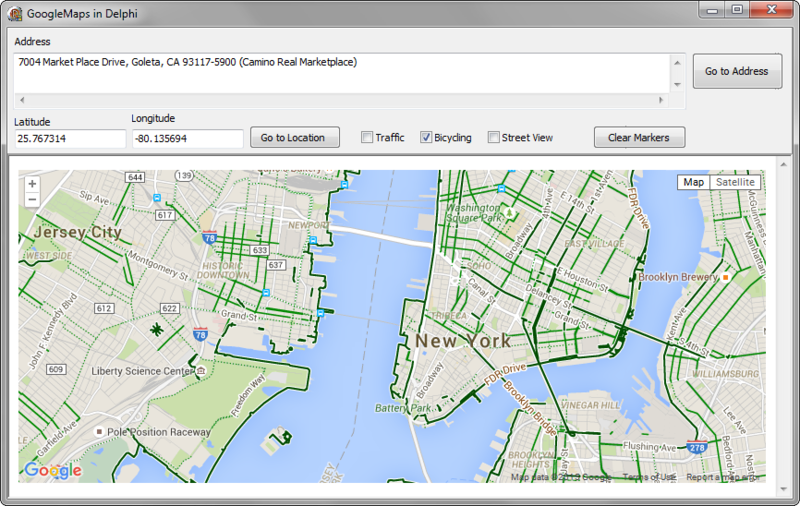 If you are experimenting some strange issues (maps goes blank, some elements of the maps are not displayed) using the Google Maps API from a desktop application. Another option is tweak the Windows registry how is shown here. By the way I just updated all the Google Maps related code of this blog (Check the updated code on Github). Categories: Delphi, Google Api | Tags: Google Api | Permalink. One of the limitations of the TRttiProperty class is which not expose any direct relation between the property and the getter and setters. On this post we will check out how we can access to such info using the RTTI. So the aim is obtain a TRttiField and/or TRttiMethod instance to the getter and setter of the property. This will be done using a class helper like so. Getting the address of the getter and setters. We need to examine such addresses to determine if represents a field or a method. So I will define a set of sample classes and dump the address of the getter and setter. 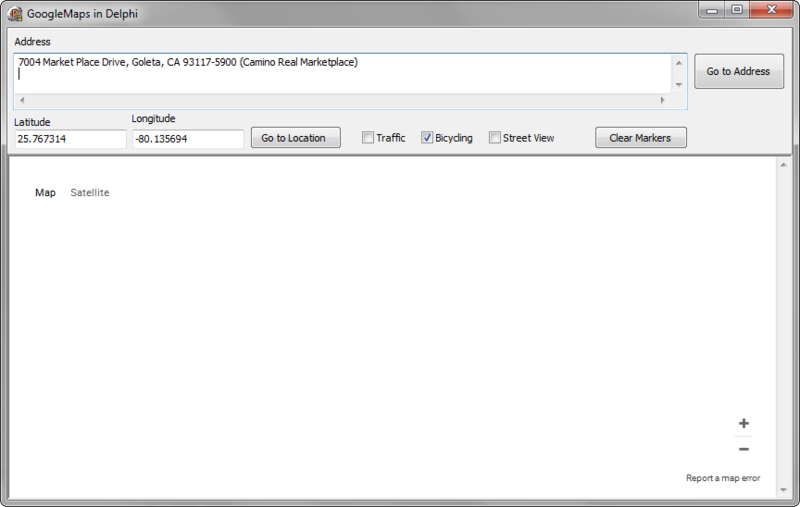 And now to obtain the addresses we will access the PropInfo member of each property in the class. A visual inspection of the returned values, indicates which the fields offsets are masked with the $FF000000 value. So with this info we can build a couple of helper functions to obtain an instance to the TRttiField . First we need determine when a getter/setter represents a field. In the System.TypInfo unit exists a private boolean function called IsField which indicates when a Pointer (GetProc, SetProc) represents a field. Now using the above method and some additional code we can build the next function which returns a TRttiField instance for the getter of a property. To obtain the setter field the code looks very similar but instead we inspect the SetProc member. To obtain a TRttiMethod instance for the setter and getter, first we need to determine if the GetProc/SetProc represent a static o virtual method, then we need to obtain the real address of the method. Luckily exist the private function GetCodePointer in the System.TypInfo unit which do this task. Note that we need a instance to the object to resolve the code address. Now we can create a function to return a TRttiMethod for the getter of a property. And for the setter is the same again but we inspect the SetProc instead. Finally we can implement the methods of our helper for the TRttiProperty class. Exist some limitations to use the above code. Delphi Array Properties are not supported for the GetProperties method. Instead you must use the GetIndexedProperties method to get a list of TRttiIndexedProperty and from there you can access to the ReadMethod and WriteMethod properties. Categories: Delphi, RTTI, RTTI | Tags: Delphi, RTTI | Permalink. The Delphi IDE Colorizer plugin now is compatible with RAD Studio 10 Seattle. This new version includes support for the new IDE enhancements like the Community toolbar, Object inspector filter and the Code navigation toolbar (Castalia). 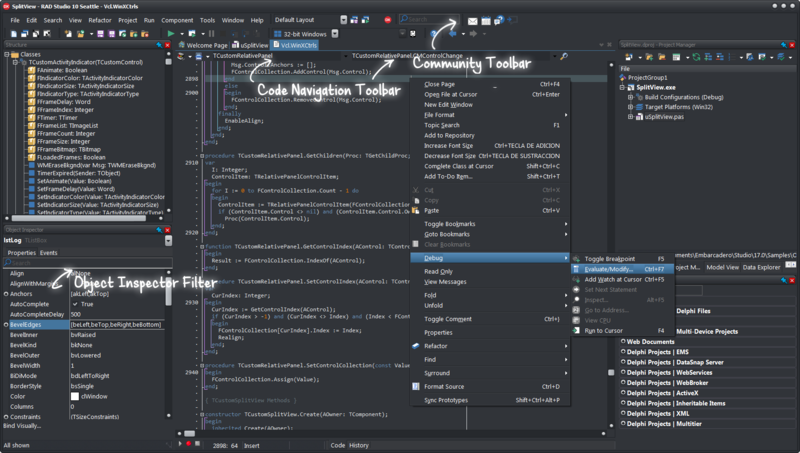 The next screenshot shown the RAD Studio 10 Seattle IDE styled with the Onyx VCL Style. You can get more info of the plugin in the github site. Remember report any issue or suggest a new feature using the issue page of the project. Categories: Delphi, Tools | Tags: Delphi, Delphi 10 Seattle, DIC | Permalink. 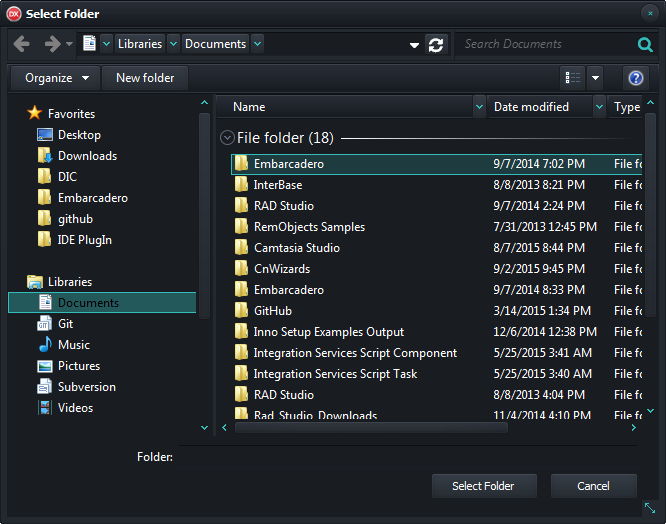 This is a summary of the current state of VCL Styles Utils project and RAD Studio 10 Seattle. The library was updated to support RAD Studio 10 Seattle. RAD Studio 10 Seattle add VCL Styling support for the classic common dialogs and for the TWebBrowser component. Using licensed code from the VCL Styles Utils project to Embarcadero. 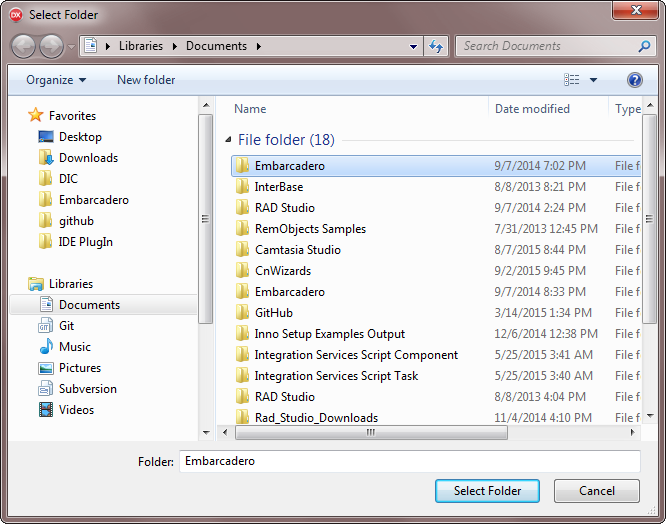 RAD Studio 10 Seattle includes a new select directory dialog using the IFileDialog interface. This dialog also can be styled using the VCL Styles Utils project. You can check more information about the VCL Styles Utils project in Github. Categories: Delphi | Tags: Delphi, RAD Studio 10 Seattle, VCL Styles Utils | Permalink.